A superior process results in a superior product. An emphasis on the strategic interests of your company determines the mission and purpose of the Web site to guide the entire process from concept to implementation. Our process starts with understanding your company objectives, business model, and core competencies. The second phase is to craft the message and content of the site from the homepage to the lowest level. By meeting with you, we focus on understanding your audience and the strengths and weaknesses of your competitors to determine positioning and to set the groundwork for the structure of your site. The structure or information architecture sets the framework for the content of your site based on how we expect users to navigate your site. Customer feedback, focus groups, site logs, and usuability testing can reveal what customers are looking for and how successfully they find it. The first two phases are often the most crucial and time consuming. Only after these phases are completed do we move on to the third phase, design which includes conceptualization and prototyping. The design process translates the message and focus of the site into a visual communication language and branding strategy. The fourth phase is production. It is here where templates are carried out and programming is executed to established specifications. 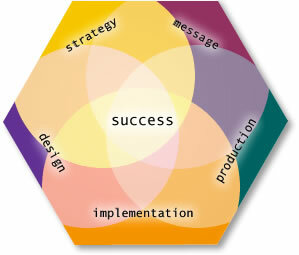 Production should lead seamlessly into the final phase, implementation. It is a this point that the site is officially launched, the promotional tasks are accomplished, and a site maintenance plan goes into effect. The maintenance plan often includes training and site guidelines to ensure long term success.